Cryptic Studios is considering playable villains for Champions Online, letting players get in touch with their dark sides. You have to hand it to Cryptic Studios, the developer seems devoted to keeping its community informed about what it's working on. In the latest issue of "Ask Cryptic" (the company's official Q&A column), the developer addressed a number of questions from the community about possible future content for Champions Online. 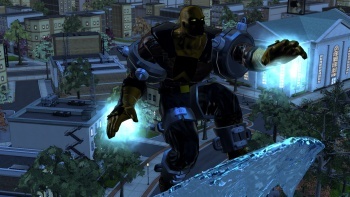 While some hopes — such as four-armed characters — were shot down, Cryptic did reveal that players might get to play as villains somewhere down the line. When asked if the game would receive a villainous expansion (similar to City of Villains), Cryptic confirmed that it was a possibility. "In the short-term," said the developer, "we're still working on providing more hero-based content. From past experience in the genre, players mainly want to play the heroes, so that was always our focus for Champions Online. However, villain play is something we have always discussed as a possible gameplay expansion. All our prototype designs for villain play involve a different dynamic which deals with less directed gameplay and more sandbox-style gameplay: stealing the parts and kidnapping scientist to construct a death ray, rampaging through the city on a destructive spree, etc. A lot of the plots outlined in our Nemesis content provide good outlines for villain-based gameplay." Being a bad guy in Champions Online would be pretty cool, but that's not the only upcoming improvement to the MMOG. I was always a much bigger fan of City of Villains than I was of City of Heroes. Cryptic also confirmed that it is working on further character appearance customization, creating new in-game special effects, and is considering adding new power types to the game.